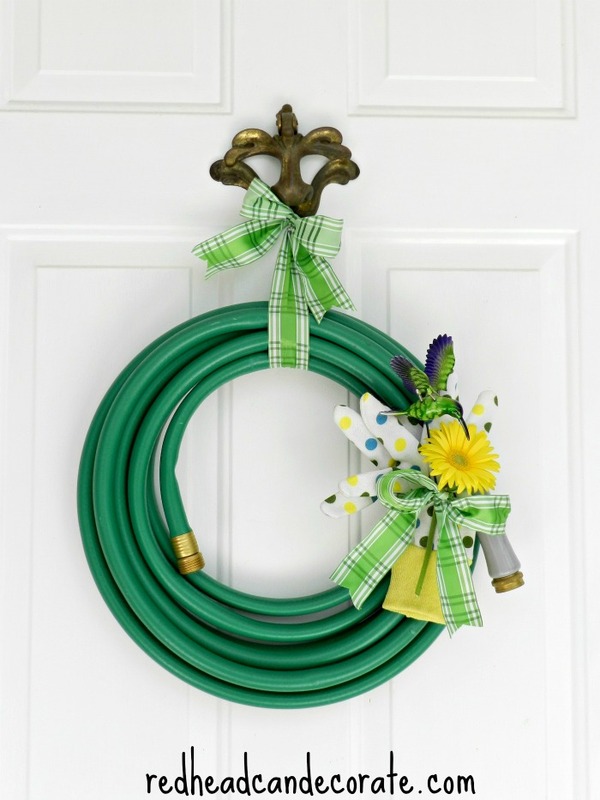 I made this Garden Hose Wreath a couple years ago and it still is one of my favorites. It took me literally minutes to make, and best of all, most of the “accessories” can be found at the dollar store. Just think of all the possibilities here with what colors you choose for the ribbon, and even the hose for that matter. 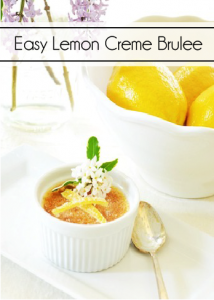 I give a full tutorial on my blog. 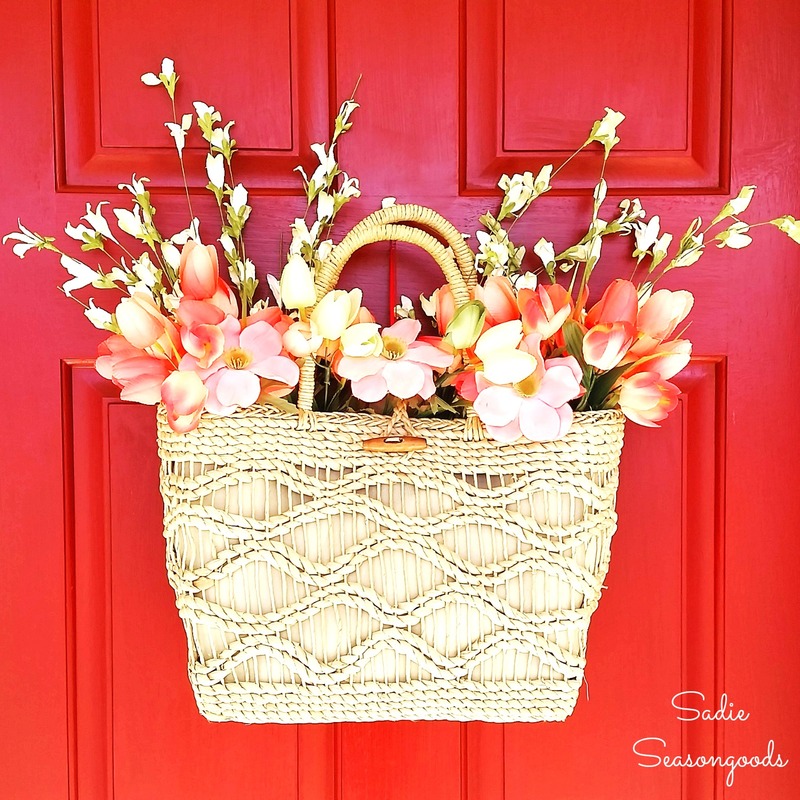 When I first came across this Thrifty Straw Purse Door Decor by Sadie Seasongoods I immediately remember I have an old straw purse in my closet that would work perfectly for this. 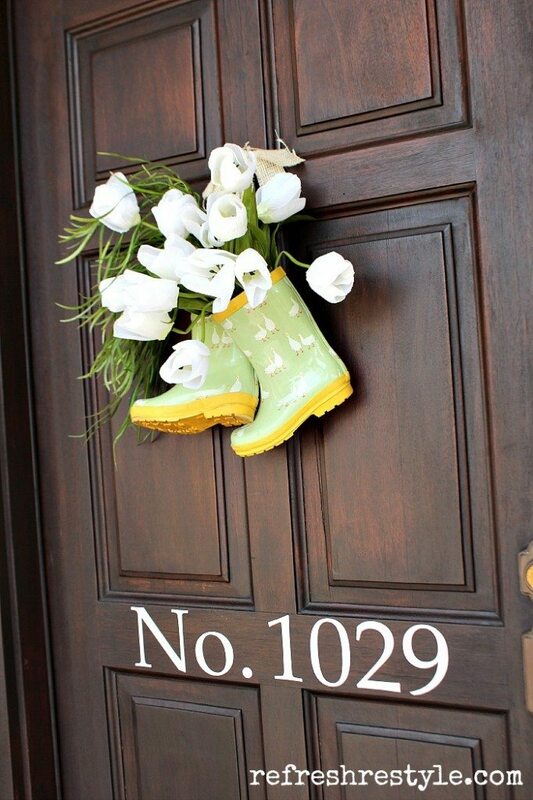 Such a cute and welcoming way to decorate the front door. I’ve seen rubber boots sitting by the front door filled with flowers, but I have never thought of actually hanging them. Great idea, Debbie! 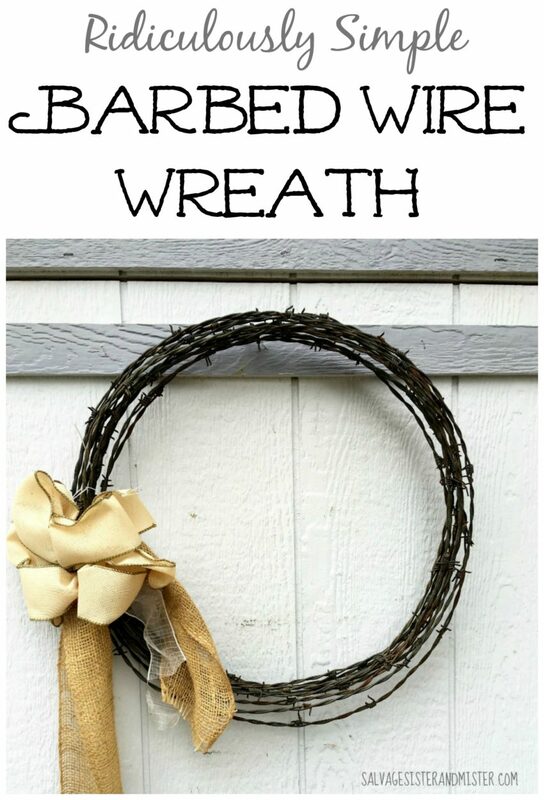 Here’s something I would have never thought of doing for a front door wreath, but how easy it would be to hang a frame, right? I bet there are many frames at your local thrift store. I may go today! I’ve seen cupcake liner wreaths before, but this Floral Cupcake Liner Wreath by the Casual Craftlete is definitely the prettiest. She gives an excellent easy to follow tutorial, too. When I first saw this Burlap Barbed Wire Wreath by Salvage Sister and Mister I loved the simplicity. Sometimes I over complicate things. I need to think more like Deborah. 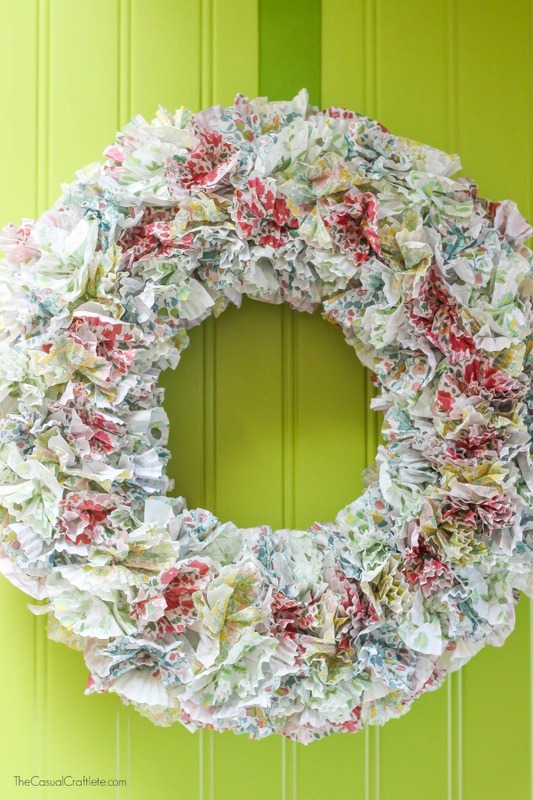 14 Comments on "Repurposed Wreath Ideas"
These are fun ideas. I think will hang the garden hose with gloves, on my door to the shed! Since I have two doors, I could make the barbed wire as the other. Thanks!! Awe, thanks so much for including that oh so simple barbed wire wreath! Much appreciated. Thank you for participating, Deborah! Happy Spring, girl! You always have such beautiful and creative wreaths! Happy Spring Vanessa! Julie…love this round-up of Spring Wreaths…I made a garden hose wreath years ago…may need to re-visit making another one! Happy Spring to you too Julie! Happy Spring to you, Shirley! 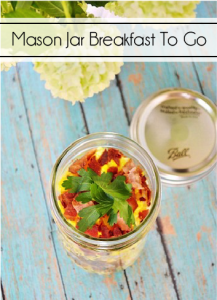 Such cute ideas and so simple to create. 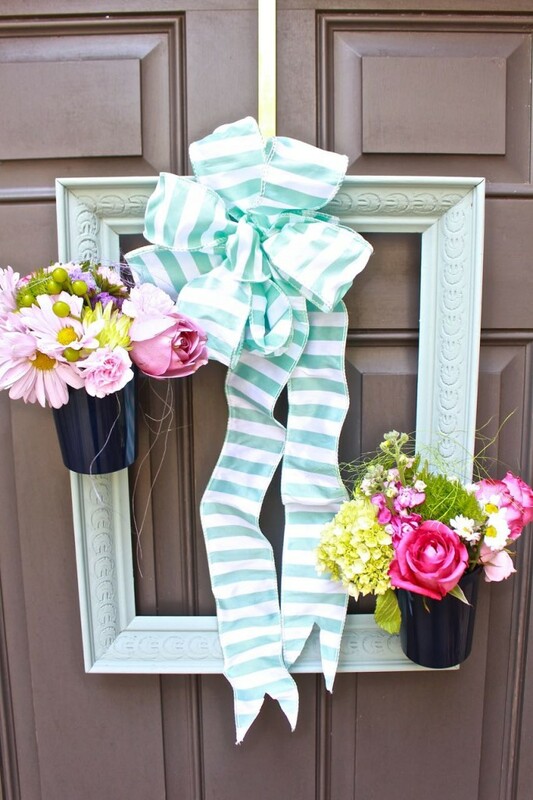 I absolutely adore the frame wreath, there are so many possibilities for how to decorate a piece like that. I love using wreathes throughout my home. 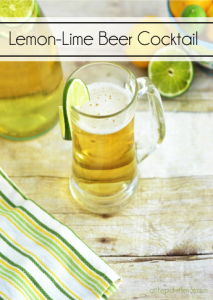 It creates a warm and welcoming vibe and I think it adds a unique home decor flair, especially when placed in slightly odd places. Oh my goodness Julie!! Thank you SO much for buying 4 of our books! We hope whoever receives them truly enjoys them. Blessings! Yeay! You are welcome, Julie!